Cool, though I'd be worried by what colombamike points out. Some of your plan views have had scaling issues in the past so it might be worthwhile to check and recheck. Scaling issues seem to be the number one problem with drawings these days! It would also help if you defined a month for the depiction. "1942" is very broad and can encompass several camouflages and AA configs. I rechecked the beam width and found it to be 109 rather 108 feet. Oops. Thanks for the effort David, it is much appreciated as this class got neglected somehow. This is the 1944 version of the ship, neither the AA nor the electronics or the mainmast is correct for 1942. 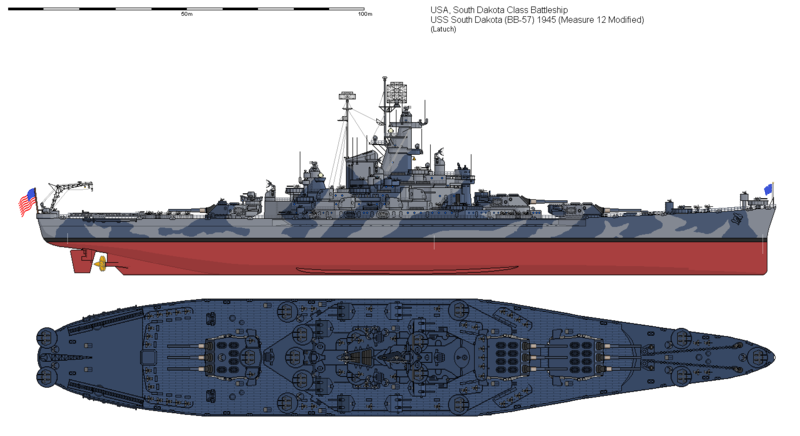 Also BB-57 never wore Ms 22, it had Ms 12 mod. for a short period and it was mostly Ms 21 throughout the war, but I haven't seen any photo of her in Ms 22. Also as the gents pointed out above the plan view seems out of proportion and I'm not happy with the shape of he hull there either. Which drawing did you use as reference for the plan view? Finally part of the blades of the inner propellers should be visible under the outer screw's skegs. Friedman's Battleships (the only source for these things) lists BB-57's beam as 108'-2". In our scale this is 216 pixels. The beam of your drawing is off by 3'-6", which isn't a HUGE deal but it's definitely a discrepancy. When scaling your plan views you should account for both beam and overall length (if you don't already). It's not up to me to decide if the plan view is inaccurate because of this discrepancy or not. Additionally, the drawing you've based this work on is the Alan Raven drawing of BB-57 in 1945 available (also) in Friedman's Battleships. If I were you, I would just update the fire control to the Mark 8 on the original drawing and relabel this as "BB-57 1945" (obviously pick a month for clarity). Alan Raven's drawings (while generally fine) do have errors and need to be checked. The drawings in Friedman's by A.D. Baker III are almost flawless and I don't think I've ever found an issue with one of them before, so just something to think about. Raven did the majority of the illustrations though unfortunately so additional checking is required. Either way, the current depiction is not accurate for 1942 just because of the medium AA fit and the whip antennas everywhere - I haven't had a chance to review the BB-57 1942 configuration in any great depth but just from the surface this drawing would best be re-labelled as "1945". I've fixed the beam problem and am at the moment changing the camo to measure 12 modified. I'll follow your recommendations after. I would not advise changing the camouflage until you have updated the entire configuration to 1942... right now there are too many areas that need to be updated. I don't have time to go and research this ship right now (need to go to the office) but I'll try to look at it tonight when I get home. It is about time these ships saw some light in the Shipbucket. Cant wait to see the end results. Last edited by David Latuch on October 11th, 2017, 7:40 pm, edited 1 time in total. At least according to the general plans, the teak decking ended at the after 20mm mounts. Great site and a good call. I'll fix it.